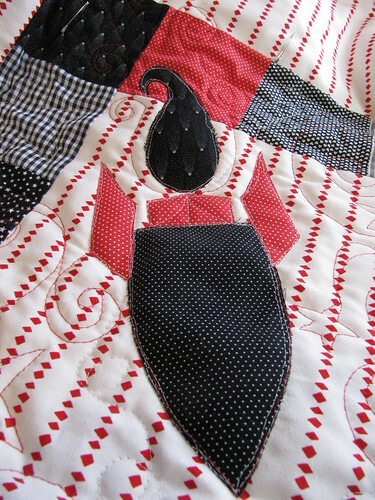 I am working on this rocket ship quilt that I’m completely in love with. However, also it is horrible and I ruined it. 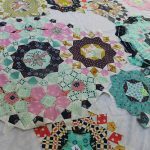 Quilty blogger Rossie has a “Process Pledge” where people talk about the mucky process of quilting vs. just showing off the magical finished project like the rainbow unicorn stork delivered it to their home. 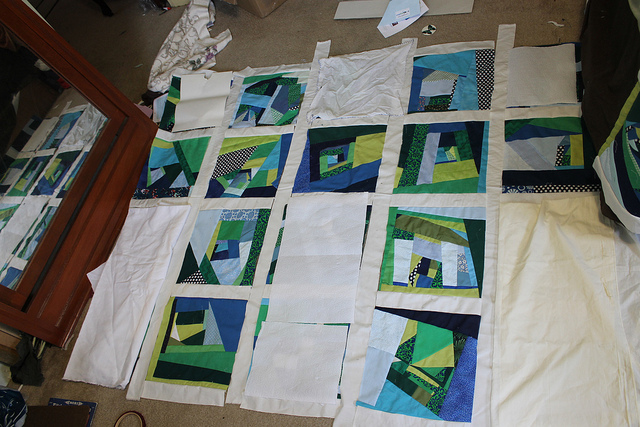 Well, the rainbow unicorn stork that delivers other people’s quilts hates me right now, so here I will complain/share my disaster process. 1. 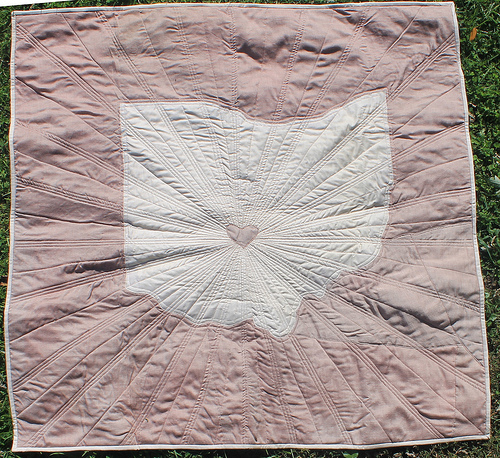 I used a super heavy cotton duck fabric. 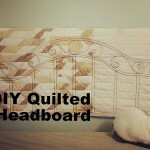 This is dumb for quilting. Oh, I knew that, but I liked it and it was like $1 a yard at Ikea two years ago so I wanted to get rid of it. 2. 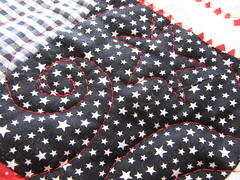 So, I’m using this super heavy ridiculous fabric and instead of just doing the most basic quilting on it with a heavy thread and straight line quilting, I decide I want to do free motion stars and swirls with a combo of red and glow in the dark thread. 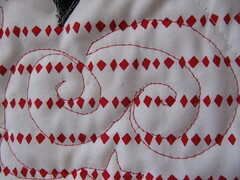 Every tiny error I make in red thread when wrestling with this quilt is magnified ten fold. The glow in the dark thread is thin and breaks easily. 3. 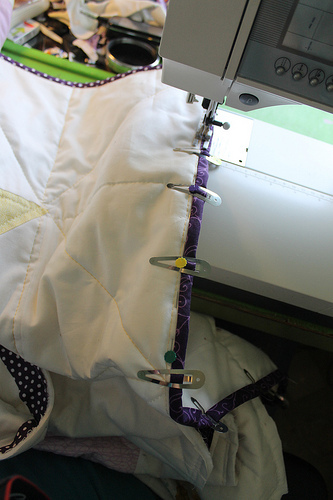 My bobbin tension is weird lately and the black thread I’m using in my bobbin is showing on top of my quilt. 4. 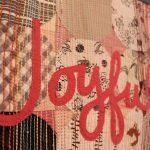 I started quilting at 10 pm on a Sunday after a busy weekend and my judgement was off. Anyway, now I have to think about what to do. Part of the glow in the dark thread looks SO AMAZING but then some of the parts on the edge aren’t as good and so it’s ruining the whole glow effect too. It’s not dark so I can’t capture that right now. If you look at it from a distance and kind of squint, it looks really cool. 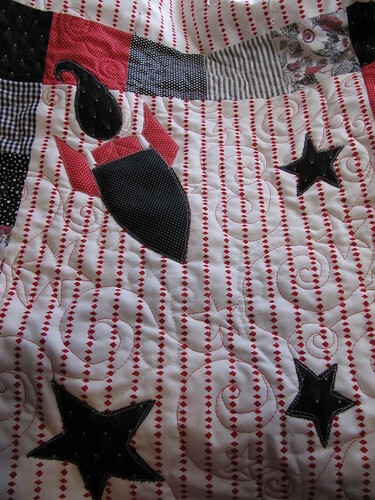 I wouldn’t be in such a flummox about it if I didn’t love the idea of red and black rocket ships with glow in the dark thread so much. It looks pretty rad from where I’m sitting. Sorry your having a bad time with it. It’s an awesome design. Thanks! 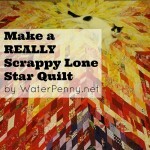 I will admit there are worse problems in my life than this quilting. I wouldn’t be so frustrated if I wasn’t so in love with the concept!